Beautiful sculpt of Liv Tyler's Arwen Undómiel! Polystone statue measures 5 1/10-inches tall. 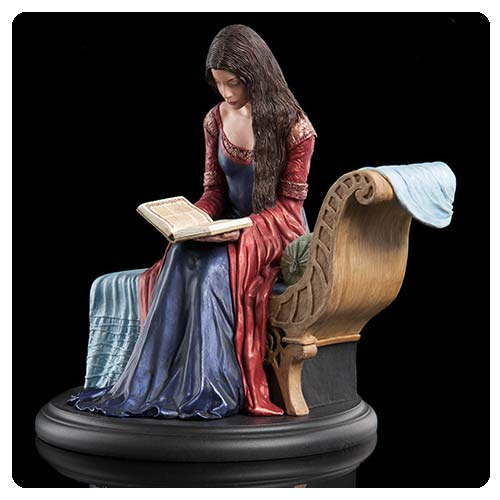 The delicately sculpted The Lord of the Rings Arwen Mini-Statue finds Aren on her chaise, reading a book with her long dark hair trailing down to her arms resting on her lap. The polystone statue was created by Steven Saunders to an amazing likeness of actress Liv Tyler. The Lord of the Rings Arwen Mini-Statue measures 5 1/10-inches tall x 5 1/10-inches wide x 4 3/10-inches long. For ages 15 and up. Daughter of the Elf Lord Elrond of Rivendell, Arwen Undómiel was among the most beautiful of the High Elves of her Age. Though as an immortal Elf she was many centuries his senior, Arwen's heart belonged to Aragorn, a mortal man and ward of Elrond who dwelt in Rivendell under the tutelage of the Elves and was fated to some day reclaim the lost throne of Gondor.